The huge red sand dunes at Sossusvlei are the most iconic attraction in Namibia. Sossusvlei is Namibia’s top selling scenery. With epic sand dunes sculpted by the wind, it’s a must-see for any visitor to this spectacular and surreal country. An endless sea of shifting sand dunes, Sossusvlei is a worldwide sensation and easily Namibia’s most iconic feature. Declared a UNESCO World Heritage site in 2013, the staggeringly beautiful scenery is bound to look familiar as it has been featured in films and advertisements far and wide. The dunes can certainly be considered the ‘trademark’ of Namibian tourism, yet they still feel so much more than just a tourist attraction. Climbing to the top of a sand dune and watching the shadows sweep across the land as the sun rises is enough to give anyone goosebumps. So, while you might have seen this terrain on the TV, there’s nothing like being here in the flesh. It’s a humbling place to take a walk and get some perspective. Sossusvlei is actually the huge flat pan in the middle of the dunes, but the dunes themselves get all the glory, and deservedly so. These giant orange sand-sculptures are some of the oldest and highest in the world and they are constantly shifting their formation with the winds. This is why Sossusvlei is often referred to as the ‘dune sea’; because the dunes are always ever-so-slightly moving in a subtle and spooky dreamlike way. The sand itself is believed to come from the Kalahari between 3 and 5 million years ago, so you’re looking at some prehistoric as well as panoramic scenery. The entire ‘dune sea’ stretches across a mind-boggling 32,000 square kilometres of Namibia and it’s difficult to describe the vastness in words. Whilst the journey to reach Sossusvlei is long, it’s an adventure in itself and truly worth the effort. The striking contrast between the bright blue skies, rich orange dunes and cracked white bases of the dry lakes (vleis) will leave you speechless. With vivid colours and vast views, it really is a photographer’s paradise and you’re free to roam over the dunes as you wish, looking for the perfect angle as you wander. At the top, you’ll be rewarded with a far-reaching view over the fantastic dune sea. Sossusvlei is the stage for a whole host of dune-based activities, so you won’t be twiddling your thumbs on this terrain. Hot air balloon rides and scenic flights are amongst the most popular options and, seeing Sossusvlei from above, you’ll get dramatic glimpse at the extraordinary extent of the dune sea. Sossusvlei is situated within the Namib-Naukluft National Park and the entrance lies at Sesriem. The gates to the Park are open from sunrise to sunset, giving you plenty of time to soak up the strange atmosphere of the dune sea. 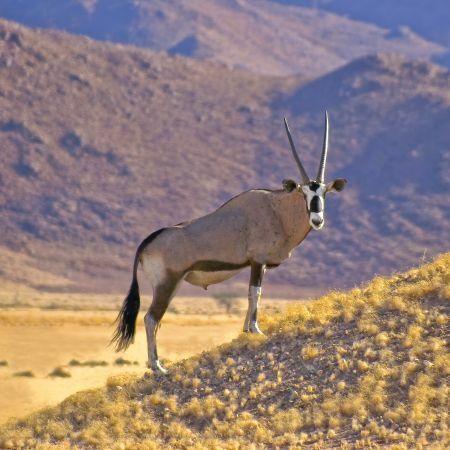 From the entrance to the Park, there’s a 70 km stretch of tarred road leading to the dunes, which passes through flat plains inhabited by oryx, ostrich and springbok. The road is pretty badly pot-holed in places, so drive carefully to avoid both shaking bones and suspension damage. As the drive from the gates to the dunes takes over an hour, the only realistic way of seeing the sun rise or set over Sossusvlei is to stay at one of the lodges right beside the gate or at one of the nearby lodges that have their own private entrances to the Park. Most of the other accommodation in the area is around 30 km to 50 km from the gate at Sesriem, so over a 100 km from the dunes themselves. To snag a dune sunrise whilst staying at one of these places, you would need to depart well before dawn, which could be a challenge. Near the entrance to the Park, you’ll find Sesriem Canyon, which is a really scenic spot for an afternoon stroll. It’s name means 'six thongs' and refers to the ropes that were tied together to draw water up from the gorge. 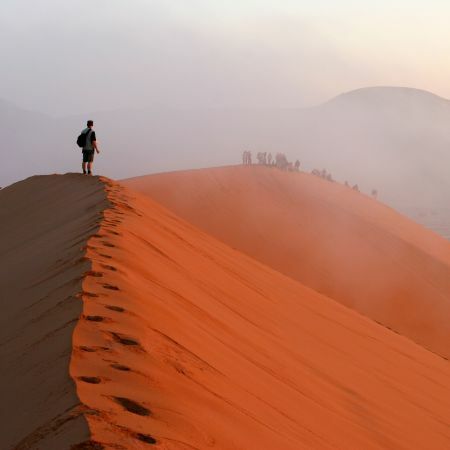 Hiking the dramatic dunes is an eternally popular pastime for visitors to Sossusvlei and the great news that there are no restrictions, so you can scramble through the sand to your heart’s content. Just remember that hiking in soft sand is pretty hard work, so it’s wise to scale the dunes nearer to dawn or dusk, avoiding the scorching heat of the day. Dune 45, named for being 45 km from the gates, is probably one of the most photographed and climbed sand dunes of all time. Standing at over 150m high, it’s a stunner and whenever you visit you’ll see a line of climbers slogging their way up to the top ridge. If you’re keen to reserve your energy for the real dunes further along the road, it’s a good spot to stop and snap the sand-hiking in action before continuing on. A 4WD is needed to negotiate at final 5 km stretch of road to the dunes. If you’re self-driving in a 2WD, you’ll simply leave your vehicle in the car park and hop on a 4WD shuttle for the last leg of the journey. Alternatively, you can start hiking at the car park and make the 4 km round to the stunningly unreal Hidden Vlei, a dry lake dotted with very dead trees and, of course, those trademark orange dunes. The route is clearly marked, so there’s very little chance of getting lost and we definitely recommend doing it in either the early morning or late afternoon, escaping the heat of the midday sun. The 4WD car park is the main hiking hub for Sossusvlei and, once you get there, there are dunes to explore in every direction. As there are no restrictions and you don’t need a guide, you’re free to clamber over the soft sand for as long as you like. Simply pick a dune and scale it. From anywhere on the dunes, you’ll be able to pick out tiny ant-like streams of people rambling over the ridges around you. It’s an almost dreamlike experience. Slogging up any of the sand dunes is steep and strenuous, but if you stick with it right to the top you’ll be richly rewarded. Soaking up the panoramic views of the dune sea stretching all the way into the horizon is something that will leave you speechless. It really is one of the planet’s most pristine and overwhelming landscapes. Not only that, but running back down the dunes is brilliantly fun and will make you feel ridiculously free - take it from us! 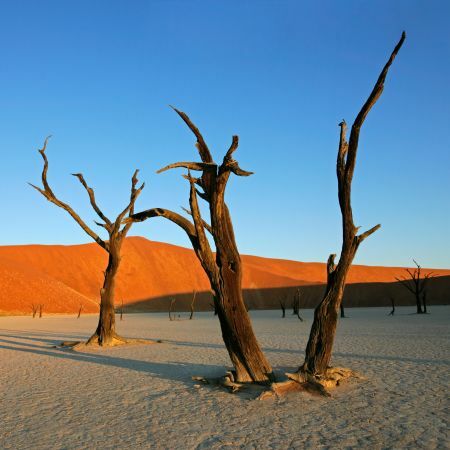 Another option is to follow a popular trail in the other direction that leads straight into the centre of the Dead Vlei. This is a really picturesque pocket of scenery amidst the dunes, with blackened, dead trees dotted across the bright white lake bed. It’s somewhere that is guaranteed to get you gasping in astonishment and set your camera working overtime. Accommodation at Kulala Desert Lodge comprises 23 thatched and canvas 'kulalas' (meaning 'to sleep' in Oshiwambo) with en-suite bathrooms and verandas. This includes 2 family tents which can accommodate 2 adults and 2 children. Accommodation consists of 11 climate-controlled, thatched 'kulalas' (the word means 'to sleep') which merge impeccably into the timeless desert landscape. Each kulala has exquisite fittings and fixtures, and an innovative bleached deck with a private plunge pool. Shaded by camel thorn trees, the lodge blends in perfectly with the spectacular desert surrounds and bears testament to the ingenuity of an eco-friendly design. The separate accommodation units are carefully laid out to perfectly blend in with the magnificent surrounding natural environment. Inspired by North African architecture, Le Mirage Desert Lodge and Spa is situated in the Namib Desert, 21 kilometres from Sesriem and the entrance gate to the Namib-Naukluft Park and Sossusvlei. From the distant road and from the air as you approach Le Mirage Desert Lodge and Spa, the three lodge buildings built largely from local rock materials, form a natural part of the desert environment totally in harmony with nature. The lodge is set to close in January 2019 for a complete refurbishment, and is due to open October 2019 with a brand new look that aims to showcase the setting. The lodge’s new design will allow for the addition of a gym and spa that will take the place of the existing guest areas, and will offer a viewpoint over the desert. All 12 tented guest houses offer private shaded sun decks, mosquito nets and air conditioning. There is also a Family House which stands apart from the guest houses, and offers a genuine experience of the quietness and vastness of the Namib desert.